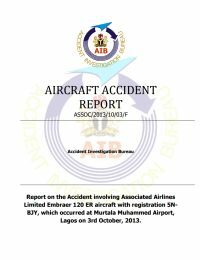 An Embraer EMB-120RT Brasilia turboprop aircraft was destroyed in an accident during takeoff from Lagos-Murtala Muhammed International Airport (LOS), Nigeria. The airplane impacted the ground near the airport fuel depot and broke up. A fire erupted. There were 20 people on board the plane. Seven occupants initially survived the accident. Three later died in hospital. Associated Aviation flight SCD-361 was on a chartered flight from Lagos to Akure, Nigeria. The airplane was carrying the body of a former Governor of Ondo State, Dr. Olusegun Agagu, for burial in Akure. At 09:07 hours local time, start-up of the aircraft was granted by the controller. Engine no.2 was started first, followed by engine no.1. At this point, the crew observed that the No. 1 engine torque indicator was stuck at 76% which prompted the Pilot Monitoring (PM) to conduct an Electronic Engine Controls (EEC) test; however, the indicator remained at 76%. The PM invited the engineer who was a crew member, into the cockpit to ascertain the job done on the EEC. The job done could not be determined as the engineer reported he was not part of the team that worked on the aircraft. The engineer then requested that the PM test the EEC, but the PM responded that this had already been done several times previously. Nonetheless, the PM repeated the EEC test. At 09:20 the PM requested taxi clearance from Lagos Tower. The flight was cleared to taxi to the holding point for runway 18L. During the taxi, the crew continued with further discussions on the state of the aircraft without briefing or referring to any document. Considering that the No. 1 torque indicator remained stuck at 76%, the crew decided to set power using T6. At 09:26 SCD361 was cleared to Akure on airway A609, climb Flight Level 190, squawk 0504 and to line-up and wait. SCD361 acknowledged. The flight crew agreed to perform a flapless take-off "again", if the flap configuration warning came on. At 09:28 the Tower controller re-cleared SCD361 to route via airway R778, Flight Level 190. The crew carried out the "Cleared into position" checklist. At about 09:29 flight 361 was cleared for takeoff on runway 18L; wind was calm. Approximately 4 seconds after engine power was advanced to commence the takeoff roll, the crew received an automated aural warning "Takeoff Flaps.. Takeoff Flaps." as the flaps had not been set for takeoff. The copilot noted that the aircraft was moving slowly. Four seconds later, the aural warning sounded: "Takeoff Flaps.. Auto feather." The flight data recorder shows that at this time the right hand engine appeared to be producing considerably less thrust than the left engine. The no. 2 prop had feathered and during the takeoff the fire handle for that engine was activated. Some 12 seconds after announcing the '80 knots' call the first officer asked if the take-off should be aborted. Airspeed at the time would have been about 95 knots. The captain indicated that they should continue. The crew did not make a V1 or Vr call. During the rotation, the first officer stated "gently". The First Officer indicated that the aircraft was not climbing and advised the captain who was flying not to stall the aircraft. Immediately after lift-off, the aircraft slowly veered off the runway heading to the right and was not climbing properly. Ten seconds after rotation the stall warning sounded. An aerodynamic stall occurred and the airplane impacted the ground in a nose down near 90 degree right bank attitude. i. The decision of the crew to continue the take-off despite the abnormal No. 2 Propeller rpm indication. ii. Low altitude stall as a result of low thrust at start of roll for take-off from No. 2 Engine caused by an undetermined malfunction of the propeller control unit. i. The aircraft was rotated before attaining V1. ii. The decision to continue the take-off with flap configuration warning and auto- feather warning at low speed. iii. Poor professional conduct of the flight crew. iv. Inadequate application of Crew Resource Management (CRM) principles. NCAA should enhance the enforcement of the regulations with regards to the implementation of operators approved personnel training program. NCAA should intensify its safety oversight function on the Airline to ensure that flight operations are carried out in accordance with approved operations manuals in line with the provisions of Nig. CARs. NCAA should intensify its safety oversight on Associated Aviation Ltd to ensure staff welfare issues, and remunerations are settled promptly. NCAA should ensure that State Confidential Voluntary Reporting System is established and implemented in line with the State Safety Program. Distance from Lagos-Murtala Muhammed International Airport to Akure Airport as the crow flies is 230 km (144 miles).